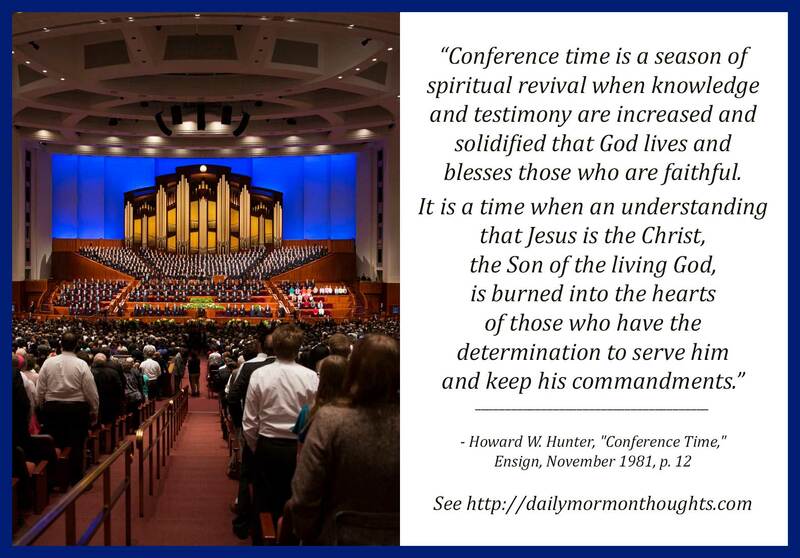 "Conference time is a season of spiritual revival when knowledge and testimony are increased and solidified that God lives and blesses those who are faithful. It is a time when an understanding that Jesus is the Christ, the Son of the living God, is burned into the hearts of those who have the determination to serve him and keep his commandments. Conference is the time when our leaders give us inspired direction in the conduct of our lives—a time when souls are stirred and resolutions are made to be better husbands and wives, fathers and mothers, more obedient sons and daughters, better friends and neighbors. 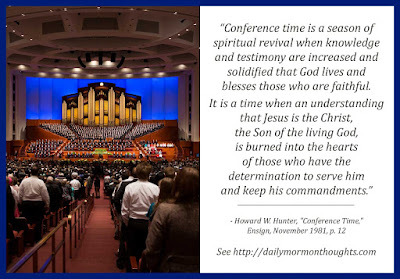 "As we enter into the spirit of conference, another feeling comes to us—one of deep gratitude that we have been blessed by an understanding of the gospel of Jesus Christ as it has been restored to earth in this dispensation of time. 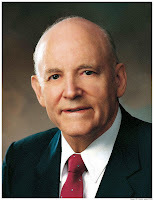 We mix with others from around the world who have that same feeling, and we wish that men and women everywhere could understand and find the joy and peace that come from the knowledge that all people are children of God and therefore brothers and sisters—literally, actually, and in fact, regardless of race, color, language, or religious belief." Faithful Church members are eagerly anticipating the coming days of "spiritual revival" available to them. The understanding that God will bless us as we are faithful is a critical one, much needed when we struggle with the challenges of our lives. Part of the blessing of conference lies in the resolutions we make to improve as we listen to the counsel that is offered. The second paragraph of President Hunter's message points out that we should feel deep gratitude for the blessings we experience during conference, of deepened understanding and growing testimony. And that gratitude should motivate us with a with that "men and women everywhere" could experience the same join and peace with us. We should be motivated to share our testimonies, to bless and lift those around us with the knowledge.